Frozen tomatoes! My newest trick in the kitchen. I learned a great trick last week and then, over the weekend, I was able to confirm that this trick actually works! My mom planted six varieties of tomato plants in the spring and now, of course, they are producing like crazy. Since my step-dad despises tomatoes and one person can't possibly eat the bounty from six plants, my mom sends me home with bags of home-grown tomatoes whenever I see her. But even I can't eat that many! So last weekend while we were at Alice's best friends birthday party, I mentioned my over-abundance of tomatoes to one of the guests and he suggested I freeze them! That's right. Take vine-ripe tomatoes, wash them, put them in ziplock baggies and then toss them in the freezer to use later in sauces and soups and such. But what about the tough skins, you wonder? Simple! When you are ready to toss those tomatoes into whatever you are making, take them out of the freezer and run them under hot tap water! No joke. Those skins will peel right off. I guess I don't have to learn how to can tomatoes anytime soon. With that frozen tomato trick up my sleeve, I made a delicious chunky sauce on Friday night. And since I still can't bring myself to eat a plate of pasta after my Whole30, I served that yummy sauce over buttered spaghetti squash "noodles." Here's how I made it. Preheat oven to 375F. Put 2 inches of water into two glass baking dishes. Pierce the skin of your two squash halves and them place them meat-side down into the water. Cover with tinfoil and then bake for 25-35 minutes, or until the flesh breaks away easily into noodles. Meanwhile, in a large sautée pan, brown the beef over medium heat. Add the onions and then, 3 minutes later, add the garlic. Sautée and stir for 2 minutes and then add the celery and carrots. 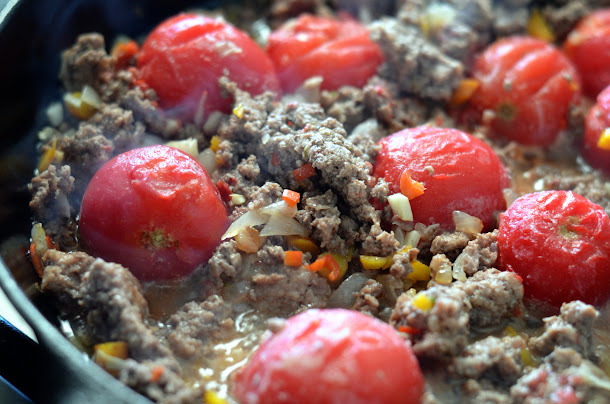 Cook for 2-3 minutes and then add the frozen tomatoes with skins removed. Add the kale and a pinch or two of salt and then let them cook down, occasionally breaking them up them with a potato masher. Add the stock and continue to cook and mash until it resembles sauce, 10-15 minutes. Turn off the heat and then add the basil and salt and pepper to taste. Using a fork, create noodles from the squash by shredding the flesh. Put it in a bowl with the butter (or ghee) and a pinch of both salt and pepper; stir. 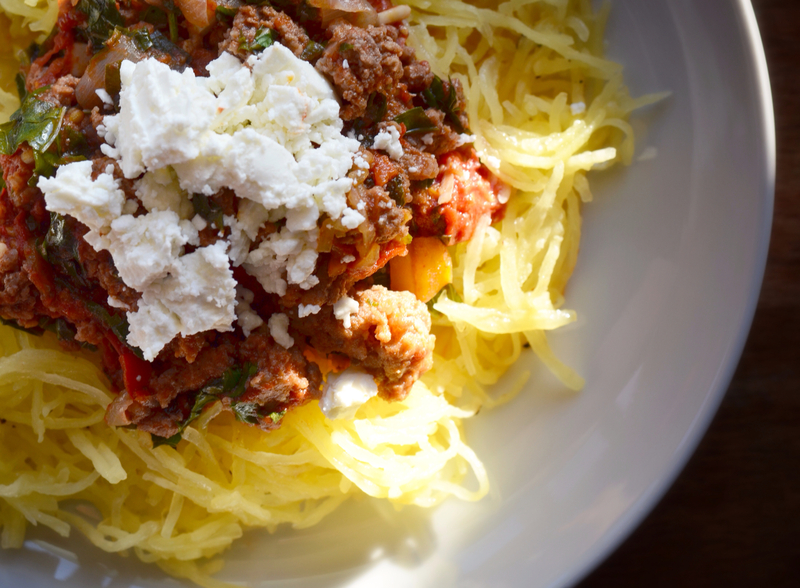 Plate the spaghetti squash noodles and top with the sauce and crumbled goat cheese. Enjoy! My oftentimes paleo-dissing husband absolutely loves this dish. He says it's one of my best creations! Try it (along with that great frozen tomato tip!) and let me know what you think. Chunky & Beefy Sauce! So delicious. Yum! This recipe looks delicious!